The lawsuit, which seeks to dissolve the foundation and bar President Donald Trump and three of his children from serving on nonprofit organizations, was an extraordinary rebuke of a sitting president. 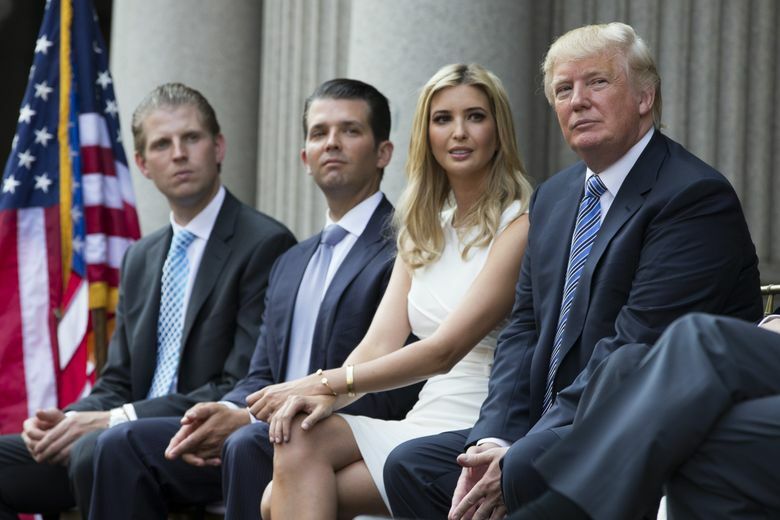 The New York State Attorney General’s Office filed a lawsuit Thursday taking aim at the Donald J. Trump Foundation, accusing the charity and the Trump family of violating campaign-finance laws, self-dealing and illegal coordination with the presidential campaign. The suit alleges “persistently illegal conduct” at the president’s personal charity, saying Donald Trump repeatedly misused the nonprofit organization — to pay off his businesses’ creditors, to decorate one of his golf clubs and to stage a multimillion-dollar giveaway at his 2016 campaign events. In the suit, Attorney General Barbara Underwood asked a state judge to dissolve the foundation, asking that its remaining $1 million in assets be distributed to other charities and that Trump be forced to pay at least $2.8 million in restitution and penalties. Underwood said oversight of spending at Trump’s foundation was so loose that its board of directors hadn’t met in 19 years, and its official treasurer wasn’t aware that he was on the board. Underwood also asked that Trump be banned from leading any other New York nonprofit organization for 10 years, seeking to apply a penalty usually reserved for the operators of small-time charity frauds to the president of the United States. But Underwood asked the judge to go further, and require the Trumps to pay millions more. She said a 20-month state investigation found that the Trumps had repeatedly violated laws that set the ground rules for tax-exempt foundations — most important, that their money is meant to serve the public good, not to provide private benefits to their founders. “This resulted in multiple violations of state and federal law,” she wrote in the legal complaint. Underwood was promoted to attorney general only weeks ago, succeeding Eric Schneiderman after he resigned because of allegations that he had physically abused several romantic partners. In tweets Thursday, the president suggested the lawsuit was politically motivated. “The sleazy New York Democrats, and their now disgraced (and run out of town) A.G. Eric Schneiderman, are doing everything they can to sue me on a foundation that took in $18,800,000 and gave out to charity more money than it took in, $19,200,000. I won’t settle this case!” he wrote. Underwood is a career staff member, not an elected official. She has said she will not seek election for a full term as attorney general in the fall. She declined to comment on the case beyond issuing a written statement. Underwood said she had sent letters to the IRS and the Federal Election Commission (FEC), identifying what she called “possible violations” of tax law and federal campaign law by Trump’s foundation. Underwood has jurisdiction over the Trump Foundation because the charity is based at Trump Tower in Manhattan and is registered in New York state. Trump has been president of the foundation since he founded it in 1987. In late 2016, he had promised to shut it down but could not while the attorney general’s investigation continued. Three of Trump’s adult children — Donald Trump Jr., Ivanka Trump and Eric Trump — also were named in the lawsuit because they have been official board members of the foundation for years. Under the law, Underwood said, board members are supposed to scrutinize a charity’s spending for signs that its leader — in this case, their father — was misusing money. In reality, Underwood wrote, the three Trump children exercised no such oversight. The board had not met since 1999. Although Donald Trump’s name is on the foundation, in recent years most of its money was not his. Trump did not donate any money to the foundation between 2008 and 2015; instead, its largest benefactors in recent years have been wrestling moguls Vince and Linda McMahon, who gave $5 million total in 2007 and 2009. Linda McMahon was later appointed by Trump to head the Small Business Administration. The McMahons have declined to answer questions about the reasons for their gifts. The lawsuit shows that the Trump Foundation looked, on paper, like other tax-exempt nonprofit organizations. It filed annual reports with New York state and the IRS. It listed directors and donations. But behind the scenes, Underwood said, the foundation was essentially one of Trump’s personal checkbooks, a pool of money that his accounting clerks knew to use whenever Trump wanted to pay a nonprofit organization. By law, Trump wasn’t allowed to buy things for himself using the charity’s money, even if he was buying them from nonprofit groups. At one point, during a deposition, a New York state investigator asked Allen Weisselberg — a Trump Organization employee who was also listed as treasurer of the Trump Foundation — whether the foundation had a policy for determining which specific payments it was allowed to make. With no outside oversight of Trump’s use of foundation money, Underwood said, the future president had repeatedly used his charity’s money to help his businesses, and himself. Twice, for instance, Trump used the charity’s money to settle legal disputes that involved his for-profit businesses. In 2007, he settled a dispute with the city of Palm Beach, Florida, over code violations at his Mar-a-Lago resort. The city agreed to waive outstanding fines if Mar-a-Lago gave $100,000 to a charity. But the donation, to an organization called Fisher House, came, instead, from the foundation, Underwood said, after Trump wrote a note to Weisselberg. “Allen W, DJT Foundation, $100,000 to Fisher House (Settlement of flag issue in Palm Beach),” said the note, which is included in the lawsuit. In addition, in 2012, a Trump golf club agreed to pay $158,000 to settle a lawsuit with a man who was denied a $1 million hole-in-one prize during a tournament at the club. The Trump Foundation paid the money instead of the club, Underwood said. Both of those payments were first reported by The Washington Post. In March, after the attorney general’s investigation had begun, Trump repaid his foundation all $258,000, plus more than $12,000 in interest, Underwood said. Underwood also listed several smaller instances of what she called “self-dealing,” meaning Trump using foundation money to help his businesses. The charity paid $5,000 to place an ad for Trump hotels in a program for a charity gala. It paid $32,000 to satisfy an obligation of a Trump company that manages a New York estate. It paid $10,000 to buy a portrait of Trump, which was later found hanging in the sports bar at Trump’s Doral golf resort. IRS rules also prohibit tax-exempt foundations from aiding political campaigns. But Underwood listed two instances in which Trump’s foundation had seemed to do so. In August 2013, Trump donated $25,000 from his foundation to a Florida political group aiding the re-election effort of state Attorney General Pam Bondi. About the same time, Bondi’s office was considering whether to join a lawsuit by Schneiderman, then the New York attorney general, alleging that Trump had defrauded students at his now-defunct Trump University. Afterward, the Trump Foundation omitted any mention of Bondi’s political group from its annual report to the IRS, and, instead, said the $25,000 donation had gone to a nonprofit organization in Kansas with a similar-sounding name. In January 2016, Trump skipped a debate among Republican candidates because he was feuding with Fox News Channel, the debate’s host. Instead, Trump held a televised fundraiser for veterans, drawing millions from wealthy friends and small-dollar donors, and giving much of it to the Trump Foundation. In his deposition, Weisselberg said he was surprised to be told he needed to go to Iowa on short notice, to have the foundation’s checkbook ready in case Trump wanted to make donations on the night of the fundraiser. “I wanted to know why I was going to Iowa. I had never gone anywhere with Donald on any kind of — anything,” he said. Underwood said that, afterward, “the Foundation ceded control over the charitable funds it raised to senior Trump Campaign staff.” She cited emails in which Corey Lewandowski, Trump’s campaign manager at the time, directed which veterans charities should receive money. At one point, the lawsuit says, Trump gave a $100,000 Trump Foundation check to a charity at a campaign event in Council Bluffs, Iowa. The problem: Nobody appears to have told the Trump Foundation. The check was later cut.